The most memorable tent-pole filmmakers — the big mainstream showmen and pleasers of crowds — often create their own self-celebrating genre. They strike upon and cautiously hone a formula (something Manmohan Desai, for example, managed to do with near-mathematical precision) and then they reap. Till, that is, someone new figures out this formula and replicates it to great effect. It is an invariable and unsurprising cycle, and it happens even though some masala filmmakers take longer to milk than others. 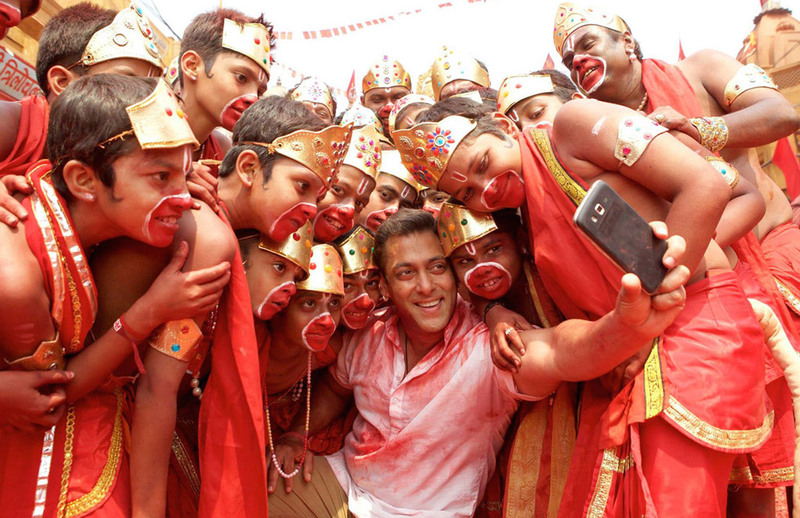 Bajrangi Bhaijaan is an overearnest, oversimplified, preposterously sweet and frequently schlocky film, which shouldn’t work because of how predictable and soppy it is. Yet, because of a finely picked supporting cast, some sharp lines of dialogue and, most crucially, because of its overall heart, it works, and works well. This may well be a Kabir Khan film, but for all those who wished to see Salman Khan in a Raju Hirani project, consider that mission accomplished. Over in the part of Kashmir that lies with our neighbours, a mother-to-be watches a cricket game on television, all but blowing kisses to a handsome green-clad batsman. The match is conquered and the kicking infant is to be named after the swaggering strokemaker, but it happens to be a girl. We meet Shahida at age six, and she’s pretty as a picture but has never spoken a word. The mother decides she’ll take this daughter to the grand wish-fulfilling dargah of Hazrat Nizamuddin over in Delhi, but things go wrong and, mostly because the poor child is unable to cry out for help, she’s left behind in India. It is in Kurukshetra that this lost little girl runs into local good-for-nothing Pavan Kumar Chaturvedi, a Hanuman-worshipper who believes she’s a brahmin — “who else could be that fair?”, he reasons — and tries to find her parents. Eventually, after naming every city he can think of, he figures out that she’s “a Mohammedan” from Pakistan, is shocked, but decides to go drop her back across the line, all while chanting Hanuman’s name and bowing to every monkey he sees. A mace-shaped pendant hangs from his thick neck, and it must be said that the well-meaning Pavan has an equally thick head. Kabir Khan cleverly cast his usually invincible hero as a smiling dullard, a man who took ten years to reach the tenth grade and eleven more years to graduate college (a nice parallel, then, to the much-mocked eternal youth enjoyed by Afridi). The thought of another film with Salman Khan flexing his biceps and ripping his shirt off to beat up a dozen men with one pelvic punch is nauseating, and thus seeing him as an emotional fool (who is too ticklish to wrestle) is automatically refreshing. 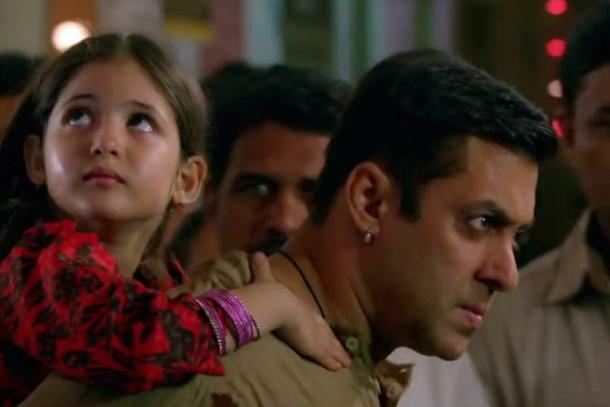 The little girl is played quite wonderfully by Harshaali Malhotra, a seraphic child with gleaming eyes and it is she who smoothens over the film’s roughest edges — like, for instance, an unnecessary fight scene in a brothel — just by looking at Salman with such sheer awe. Nawazuddin Siddiqui leads the supporting cast, playing a Pakistani news-scavenger based, oddly enough, on Chand Nawab, a real-life reporter who went viral following a clip where passers-by (and his own concentration) couldn’t make room for his modest intentions. Siddiqui nails that particular scene and brings much credibility to the proceedings, excelling with his body language here while laughing uncontrollably lying on a bed of corn or when grabbing an old man’s hand to get himself forcibly slapped. Siddiqui sinks his teeth into a good part and runs with it; at one point, when putting up a story he has shot himself on YouTube, his character — so used to desperately slapping his credit on the videos he sells to news channels — signs off, out of habit, “cameraman Chand Nawaz ke saath, Chand Nawaz…” Perfect. Kareena Kapoor Khan looks dazzling but has far too little to do, Sharat Saxena and Rajesh Sharma are routinely excellent in their gruff roles, and Om Puri has a warm little cameo, but the film is set up by the overwhelming earnestness of Meher Vij in the role of Shahida’s mother, who wears her heartbreak very believably indeed. The filmmakers even throw in one of the old men from that great Kashmir film, Haider in a bid for credibility, and having all these fine actors even in tiny parts helps things considerably. At two hours and forty minutes, Bajrangi Bhaijaan is seriously long and the climax feels it might never end, but hey, haven’t classic Bollywood weepies always gone on forever? At least Kabir Khan has done his tearjerking properly, added in some burkha tomfoolery and, at one point when the young girl wants chicken and her guardian can’t deal with it, even thrown some Benny Hill madness into it. I tell you, that Hirani code stands cracked good. In one scene a Pakistani cop, suspicious of his quarry, brusquely interrogates them and Nawaz foxily conjures up a tale of star-crossed lovers and elopement. The policeman breaks into a grin, his ears perk up, and he immediately wants to know more. India, Pakistan, whatever: we’re all just suckers for story. Jai Shri Drama. Very pleased to read ur review sir……so precisely u have analysed the film that every line of ur review becomes satyavachan………thnx..